I'm super excited to be showing you two cards today. 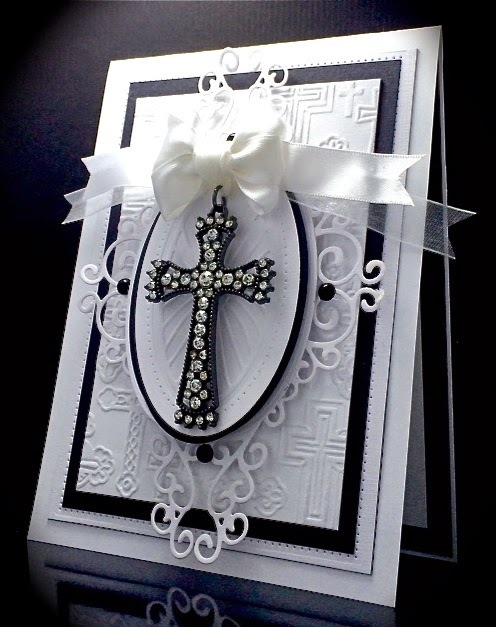 First is this Black and White Card that comes with a lovely Cross Pendant ( ideal for a Wedding, or any Christian Celebration like Anniversary, Communion, or Confirmation). It was created using with Sue Wilson's NEWLY released Collections; Finishing Touches Ornamental Corners and Caribbean Island Background Dies. Oh my, wait until you see Sue Wilson's NEWEST 38 releases!! They are stunning, ornamental and just incredible in design and versatility! I'm in LOVE. I'm especially diggin' how the large Caribbean BG die can give your card that beautiful pierced look. I love how these Finishing Touches Ornamental Corners can be arranged in various ways to form different looks too. Ive used these corner cuts to showcase the Cross Pendant on my Wedding Card. Did this by adhering corner cuts to the center of a smaller oval behind main panel holding the Lovely Cross. The Background was embossed using a Darice EF. Check out the Creative Expressions site for Sue Wilson Products HERE. Thanks for visiting. I love hearing from you. Happy Creating! 2 stunning cards America great design and so elegant. wow America, both of these are just stunning! Truly stunning cards! So elegant. Strikingly stunning and elegant!! Thank you for joining in with us at Love To Scrap. Wow, these are stunning! Thanks for playing with us over at Loves Rubberstamps!!! Gorgeous cards! Thanks for joining the Loves Rubberstamps challenge this week! 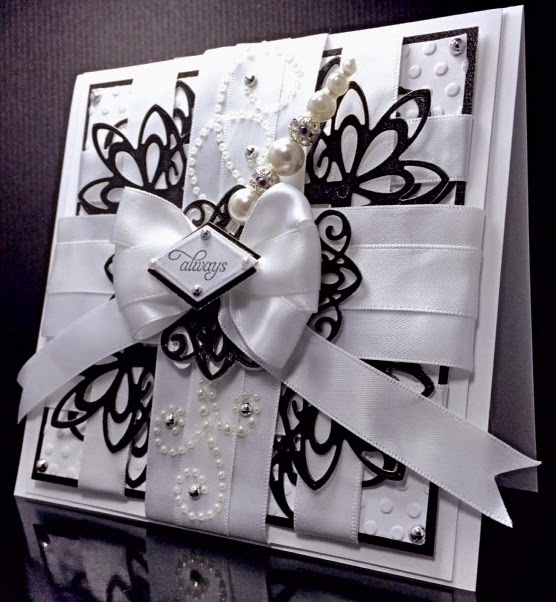 Stunning cards, thank you so much for playing with Simply Create Too. Thanks for sharing your card at Love To Scrap! Challenge Blog! Hope to see you again soon!! HUGS! Absolutely gorgeous wedding card...love all the beautiful details. Thank you so much for playing along with us at Simply Create Too. Wow, these are gorgeous, elegant cards. Such fabulous use of dies.